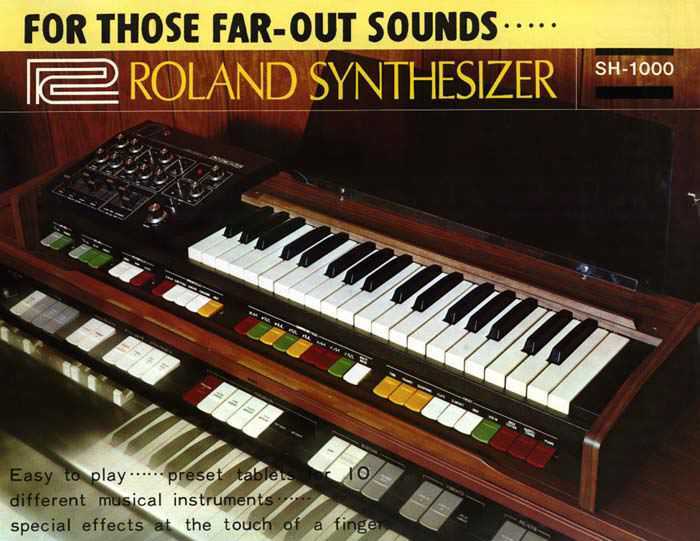 The SH-1000 has the distinction of being (according to Roland) the first keyboard synthesizer made in Japan. "It is a weird synth from a time when synth manufacturers were probably trying to figure out the best way to market synths to people outside academia. The SH-1000 thus has many color tabs on the front of it just like Grandma's organ. It even has two little holes drilled in the top so you can put in a little music stand. It's not quite a preset synth though. It does have 10 presets that are not editable other than to add vibrato or tremolo. But it also has tabs for creating your own sounds from scratch. You could select 32' square or ramp, 16' pwm, etc.